Weston-super-Mare is the traditional seaside destination for the Bath area, its name conjuring up memories of childhood trips to play on the muddy beach and ride on Weston’s famous donkeys. Despite the fond nostalgia, Weston’s charms seems a bit humble and unappealing in these days of bargain trips to foreign sunshine. But Weston-super-Mare is still an easy day trip from Bath, and still has many of the attractions of a traditional British seaside resort, so it would be over-hasty to dismiss it out of hand. On summer weekends, families still catch the train to the seaside armed with buckets, spades and beach paraphernalia. With a beach that is more like a mud flat, and a low tide during which the sea is no more than a distant rumour, Weston is certainly not among the most pretty or sandy of English beaches. 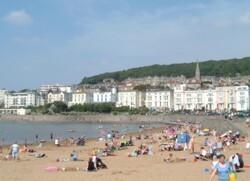 The bay faces onto the Bristol Channel, along the north coast of Somerset, with views extending across the water to Wales. The beach’s surface consists of more mud than sand, and when the tide drops, eager children won’t be able to approach the water; danger signs warn holidaymakers of the risks of walking out over the mud. All is not lost, however. An artificial lake to the northern end of the main beach provides a place where children can splash about safely, and there is even a small and popular stretch of sand for a contrived but satisfactory beach experience. Weston-super-Mare’s tourist information office is easy to find, over the road from the seafront, close to the pier. You can pick up good maps and plenty of information on the town’s attractions. Opposite the tourist information office, the Grand Pier is the central landmark on Weston-super-Mare’s seafront. The original pier was destroyed in a fire in 2008 and was rebuilt in a modern style, still offering the typical seaside entertainment of arcade games and sea views. Strolling along the pier and back makes a pleasing promenade, although if you’re tired or lazy there is also a mini-train service along the length of the boards. If you like the noisy excitement of the arcade and the funfair, you’ll enjoy the pier’s attractions: gambling machines as well as funfair-type rides and shooting ranges. It may be an expensive way to have fun, but for many this is an essential part of the seaside resort experience. If you prefer a quieter experience, you can simply do a circuit of the pavilion to admire the views from the pier, over Brean Down in one direction, across the waters to Wales, and along the shore to the white curves of the older parts of Weston. A stroll along the seafront is both scenic and interesting. Weston’s decades of popularity as a seaside resort have left a legacy of period buildings, from the Winter Gardens on the promenade to the curving rows of tall, peeling guest houses and hotels. One of the most intriguing sights is Knightstone Island, between the harbour and the Marine Lake. Some charming, ornate (and until recently picturesquely-dilapidated) buildings cluster on this little promontory, which has recently been redeveloped as a luxury complex. Past the Marine Lake, several small cafes compete for business away from the hubbub of the beach, while visitors stroll along a path above the rocky seashore. Just past Anchor Head is an even more picturesque vision: the tumbledown stretch of Birnbeck Pier, an abandoned and haunted old pleasure-pier. If you want to see further than the centre of Weston, there is an open top bus service (in season) which runs along the coast to Sand Bay, making a pleasant excursion. Active visitors will find good walking opportunities in either direction along the coast. There are also boat trips to the nature reserve of Steep Holm Island, a small rocky island in the Bristol Channel. For more traditional seaside activities, you could visit the town’s aquarium, play a round on a putting green, enjoy chips on the seafront, and watch (or have a go at) wind sports, volleyball and kite-flying. Most adult residents of Bath and Bristol probably have fond memories of childhood trips riding on the donkeys at Weston-super-Mare. Weston is good at catering for its visitors – there are plenty of facilities including fine public toilets, drinking water taps and free organised children’s activities in the summer holidays. It’s simple and quick to reach Weston-super-Mare from Bath. Trains run from Bath Spa railway station approximately hourly. Some are high-speed direct trains, others require a change in Bristol. The journey takes from 50 minutes. The seafront in Weston is just a short walk from the railway station, and is signposted (just turn left and walk straight on). Want to spend the night in Weston-super-Mare? The resort has quite a good selection of hotels, B&Bs and apartments, many with sea views.